Lately it has become fashionable to question whether the Biblical accounts of a strong kingdom ruled by David and Solomon could have even existed in the 10 century BC (BCE). Many scholars consider the accounts to be rather mythical in nature. Now a recent archeological finding lends strong support to the Biblical record. “The city wall that has been uncovered testifies to a ruling presence. Its strength and form of construction indicate a high level of engineering, and the city wall is at the eastern end of the Ophel area in a high, strategic location atop the western slope of the Kidron Valley. 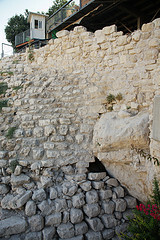 “A comparison of this latest finding with city walls and gates from the period of the First Temple, as well as pottery found at the site, enable us to postulate, with a great degree of assurance, that the wall that has been revealed is that which was built by King Solomon in Jerusalem in the latter part of the tenth century BCE. Response: It is ‘politically correct’ in Europe and on most University campuses around the world to question the Jewish historical ties to Jerusalem. Since it is the Biblical record that supports their claims to the land many European scholars have questioned the historicity of the Biblical accounts themselves. Add to that the fact that ‘oil money’ from Muslim countries like Saudi Arabia is supporting many of the European scholars along with their research and archeological digs. The result is that some of the prevailing archeological theories are actually agenda driven.